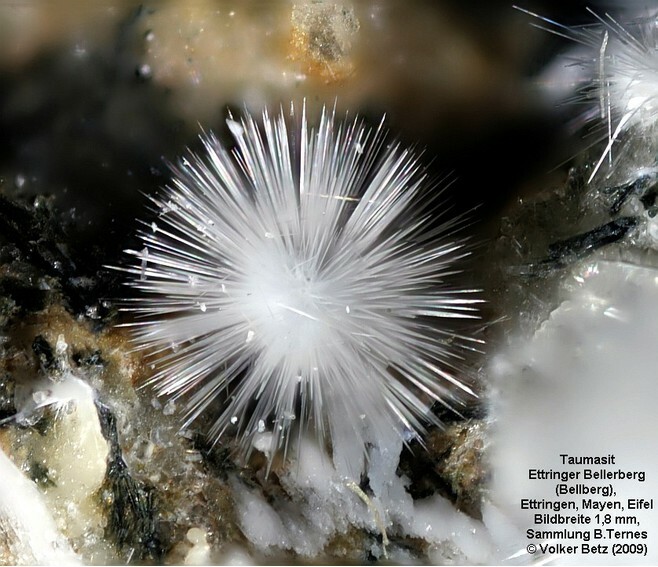 Thaumasite: Mineral information, data and localities. May contain sulfite (Pekov et al., 2012). Although it is generally assumed that a solid solution series between thaumasite and ettringite exists, both species have different space groups and a possible discontinuity was identified, characterised by a gap in the a-dimension of the solid solution phases (Barnett et al., 2000). Further work showed a miscibility gap in the solid solution (Barnett et al., 2003): ettringite can accept the replacement of 1/2 its Al by Si, while thaumasite tolerates little or no Al in its structure. 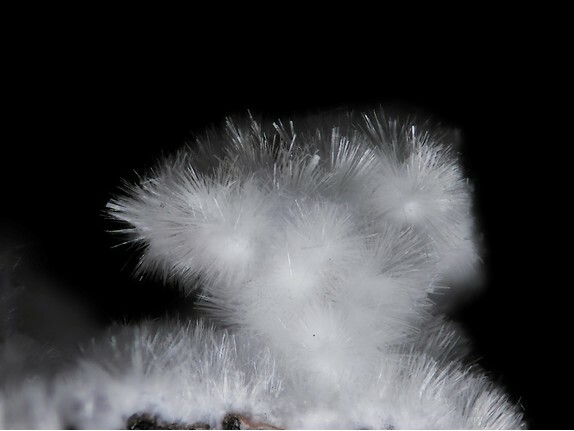 The Si analogue of Carraraite. Also compare Hielscherite and Chelyabinskite. Visit gemdat.org for gemological information about Thaumasite. Calcite 12 photos of Thaumasite associated with Calcite on mindat.org. Ettringite 7 photos of Thaumasite associated with Ettringite on mindat.org. Prehnite 6 photos of Thaumasite associated with Prehnite on mindat.org. Gaudefroyite 6 photos of Thaumasite associated with Gaudefroyite on mindat.org. Tobermorite 5 photos of Thaumasite associated with Tobermorite on mindat.org. Byssolite 4 photos of Thaumasite associated with Byssolite on mindat.org. Chabazite 4 photos of Thaumasite associated with Chabazite on mindat.org. Natrolite 4 photos of Thaumasite associated with Natrolite on mindat.org. Oldhamite 3 photos of Thaumasite associated with Oldhamite on mindat.org. Cuspidine 3 photos of Thaumasite associated with Cuspidine on mindat.org. Nordenskiöld, A.E. (1878) Sur une nouvelle espèce minérale nommée thaumasite. Comptes Rendus Hebdomadaires des Séances de l’Académie des Sciences: 87: 313-314. Penfield, S.L. Pratt, J.H. (1896) On the Occurrence of Thaumasite at West Paterson, New Jersey. American Journal of Science: 1: 229-233. Pisani, F. (1896) Note sur la thaumasite. Bulletin de la Société française de minéralogie: 19: 85. (1914) Thaumasite Secret Solved by Amateur, 1914 November 23, New York Times. Edge, R.A. and Taylor, H.F.W. (1969) Crystal structure of thaumasite, a mineral containing [Si(OH)6]2- groups. Nature: 224: 363-364. Edge, R.A., Taylor, H.F.W. (1971) Crystal structure of Thaumasite, [Ca3Si(OH)6·12H2O](SO4)(CO3). Acta Crystallographica: B27: 594-601. Zemann, J., Zobetz, E. (1981) Do the carbonate groups in thaumasite have anomalously large deviations from coplanarity? Kristallografija: 26: 1215–1217. Effenberger, H., Kirfel, A., Will, G., Zobetz, E. (1983) A further refinement of the crystal structure of thaumasite, Ca3Si(OH)6CO3SO4•12H2O. Neues Jahrbuch für Mineralogie, Monatshefte: 1983: 60-68. Grubessi, O., Mottana, A., Paris, E. (1986) Thaumasite from the Tschwinning [N’Chwaning] mine, South Africa. Tschermaks Mineralogische und Petrographische Mitteilungen: 35: 149–156. Brough, A.R. and Atkinson, A. (2001) Micro-Raman spectroscopy of thaumasite. Cement and Concrete Composites: 31: 421-424. Jacobsen, S.D., Smyth, J.R., Swope, R.J. (2003) Thermal expansion of hydrated six-coordinate silicon in thaumasite, Ca3Si(OH)6 (CO3) (SO4) 12 H2O. Physics and Chemistry of Minerals: 30: 321–329. Martucci, A., Cruciani, G. (2006) In situ time resolved synchrotron powder diffraction study of thaumasite. Physics and Chemistry of Minerals: 33: 723-731. Pekov, I.V., Chukanov, N.V., Britvin, S.N., Kabalov, Y.K., Göttlicher, J., Yapaskurt, V.O., Zadov, A.E., Krivovichev, S.V., Schüller, W., Ternes, B. (2012) The sulfite anion in ettringite-group minerals: a new mineral species hielscherite, Ca3Si(OH)6(SO4)(SO3)·11H2O, and the thaumasite-hielscherite solid-solution series. Mineralogical Magazine: 76: 1133-1152. The following Thaumasite specimens are currently listed for sale on minfind.com. GRAHAM, R.P.D. 1918) Thaumasite from the Corporation quarry and saponite from Mont Royal tunnel. Trans. Roy. Soc. Can. Ser. 3, Vol. 12, 197-201. Bellatreccia, F., Fiori, S. (2004) La thaumasite di Vallerano (RM). Il Cercapietre, 1-2, articolo 8, 64-65; http://www.gminromano.it/Cercapietre/rivista04/testo/04A08.html. - Gramaccioli, C.M., Scaini, G., Gentile, P., De Michele, V., Mannucci, G. (1992): Natura in Lombardia. I Minerali. Regione Lombardia, Ed., Milano, 223 pp. De Michele, V. (1974). Guida mineralogica d'Italia, 2vol., Istit. Geogr. De Agostini, Novara, Italia, 216 & 192 pp. Dini, A., Orlandi, P. & Vezzoni, S. (2013). Temperino e Lanzi. Le paragenesi primarie dello skarn. Rivista Mineralogica Italiana, 1/2013, 28-39. Mineralogical Record: 27: 303.; Henmi, C., Kusachi, I., & Henmi, K. (1996). Zirconium minerals and zirconian garnet from Fuka, Okayama Prefecture, Japan. Mineralogical Journal, 18(2), 54-59.; KUSACHI, I., & HENMI, C. (1991). Sillenite from Fuka, Okayama prefecture, Japan. Mineralogical Journal, 15(8), 343-348. Takeshita & Yatagai (1980) Chigaku Kenkyu, 31, 45-50.
http://www.natural-analogues.com/maqarin.htm; Pitty, A. F., & Alexander, W. R. (2010). A natural analogue study of cement buffered, hyperalkaline groundwaters and their interaction with a repository host rock IV: an examination of the Khushaym Matruk (central Jordan) and Maqarin (northern Jordan) sites. NDA-RWMD Technical Report, NDA, Moors Row, UK. ; Khoury, H. N., Salameh, E., & Abdul-Jaber, Q. (1985). Characteristics of an unusual highly alkaline water from the Maqarin area, northern Jordan. Journal of Hydrology, 81(1), 79-91.; Khoury, H. and Nassir, S. (1982): High temperature mineralization in the bituminous limestone in Maqarin area - North Jordan. Neues Jahrbuch für Mineralogie, Abhandlungen, 144, 197-213. Nordenskiöld, A.E. (1878): Sur une nouvelle espèce minérale nommée thaumasite. Comptes Rendus Hebdomadaires des Séances de l’Académie des Sciences. 87, 313-314. ; Dana 6:698. LTU-DT-0536-SE. Wanhainen.Aitik (Doctoral thesis); Knipfer, S., Nordin, R., Wasström, A., Höglund, S., Joslin, G., & Wanhainen, C. The Aitik porphyry Cu-Au-Ag-(Mo) deposit in Sweden. Xray; Curator J.Langhof, Museum of Natural History (NRM) Stockholm; Thorin, L. (1989). Mineralnotiser. Stuffen (Medlemsblad för Södertörn Amatörgeologiska Sällskap). Nr 38, 11. Mineralogical Magazine 1960 32 : 416-418. Wilson, M.J. (1978). Occurrence of thaumasite in weathered furnace slag, Merthyr Tydfil. Mineralogical Magazine, 42, 290-291. Anthony, J.W., et al (1995), Mineralogy of Arizona, 3rd.ed. : 179, 394, 414; Butler, B.S., et al (1938b), Geology and ore deposits of the Tombstone district, AZ, AZ Bur. Mines Bull. 143; Schaller, W.T. (1939), Corrections and additions, Am.Min. : 24: 346-347; Galbraith, F.W. & D.J. Brennan (1959), Minerals of AZ: 97, 99, 111. Wilson, W.E. (1988), The Iron Cap Mine, Min.Rec. : 19(2): 81-87. Gray, R.F., Hoffman, V.F., Bagan, R.J., and McKinley, H.L. (1968) Bishop tungsten district. In Ore Deposits of the United States, 1933-1967. The Graton-Sales volume, New York. A.I.M.E. : 1553; Pemberton, H. Earl (1983), Minerals of California; Van Nostrand Reinholt Press: 478. Woodford, A.O., Crippen, R.A., and Garner, K.B. (1941), Section Across Commercial Quarry, Crestmore, California; American Mineralogist: 26: 367; Pemberton, H. Earl (1983), Minerals of California; Van Nostrand Reinholt Press: 478. Woodford, A.O., Crippen, R.A., and Garner, K.B. (1941), Section Across Commercial Quarry, Crestmore, California; American Mineralogist: 26: 367, 374. Woodford, A.O., Crippen, R.A., and Garner, K.B. (1941), Section Across Commercial Quarry, Crestmore, California; American Mineralogist: 26: 367. Hewett, Donnel Foster (1956) Geology and mineral resources of the Ivanpah quadrangle, California and Nevada, USGS Professional Paper 275, 172 pp. : 70-72, 118; Pemberton, H. Earl (1983), Minerals of California; Van Nostrand Reinholt Press: 394, 478. Hewett, D. F. (1956) Geology and mineral resources of the Ivanpah quadrangle, California and Nevada, USGS Professional Paper 275, 172 pp. : 70-72.
ⓘ Marcella Mine (Marcello Mine) ? ⓘ State Route 189 road cut ? Schaller, W., 1938, An Unusual Form of Thaumasite from the Ducktown District, Tennessee, American Mineralogist, v23, 876-880. Badalov, S.T. & Golovanov, I.M. 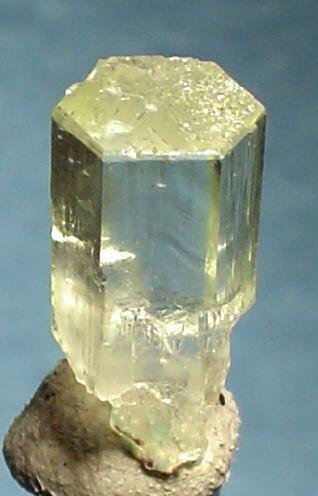 (1957): Birunite - a new mineral of the thaumasite group. Doklady Akademii Nauk Uzbekistan SSR, 12, 17-21 (in Russian).